Every ABLE SALES Compressor is backed by a 12 month warranty for peace of mind. Why not come and discuss your needs in either our Melbourne Perth or Brisbane showrooms today. 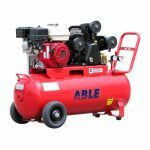 A petrol air compressor is best suited for mobile or stationary, and for real heavy duty use, you’ll find Able Sales Petrol Air Compressors are a heavy duty and high quality. 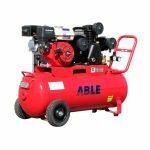 Petrol air compressors are mostly used on service vehicles, tyre service or where larger volumes of air are required. You have a 12 month warranty and it's 100% rebuildable. This is a machine you do not have to throw away. 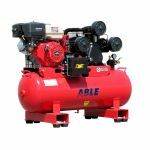 Able's petrol compressors may be low on cost but they are far from disposable. This machine is built strong from durable cast iron and runs at a low RPM to minimise wear and tear. Our pressure vessels are registered with worksafe compliance and built to Australian Standard AS1210 with a design life of 20 years.